Crete Park Pals purpose is to bring corporate money and donations to Park Pals so we can reach our never-ending quest to make tomorrow better than today for families. Crete Park Pals is a nonprofit group used to lower the costs of improvements, programming, and advertising in Crete. All of the funds benefit families in and around Crete. This nonprofit is used as a vehicle to apply for more grants and lower costs in many avenues for Crete Park District and their taxpayers. What’s the catch? Several of the grants require matching funds. 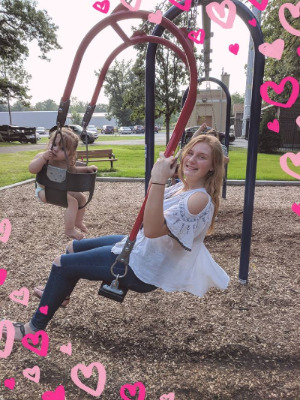 Last year we were able to raise enough money to upgrade our swings in Crete Park to the Expression Swings! Each year we save over $1000 by doing all the bulk mailing at the nonprofit rate. This is money that we are able to return to making things better for our families. Our goal is to raise money through corporate donation programs, events and donations from families like you. Want to help? Check out smile.amazon.com and choose Crete Park Pals as your nonprofit. Each year we get a check from Amazon for a portion of qualified purchases. Cone Cottage has also been gracious enough to host an event with us each summer and donating part of its profit for the day. Last year H&R Block in Steger donated a portion of their new customer earnings which was amazing. We also hold small raffles during special events. Another great fundraising tool has been the Facebook Nonprofit Program. Several people have used their birthday to get donations for Crete Park Pals. What an amazing gift! Many of us have more than we will ever need and this gives us the vehicle to give back. Crete Park District is doing an excellent job in presenting programming and parks throughout Crete. They are proud to live within the budget given to them by the taxpayers of Crete and serve families from all over the area. The average tax payment to the Crete Park District is $178 per home, per year. They currently own 139 acres and 2 buildings plus run a multitude of programs and special events for our area. This is an amazing benefit for a low cost. Park Staff refer to it as squeezing everything out of each penny we receive. We would like to see the programming expand to provide for the continually growing community, but wish to do so through those that are able to give and not burden the homeowners who are unable to give at this time. Through your generosity, Crete Park Pals will provide an avenue to raise funds and accept tax-deductible donations to help Crete Park District further it’s goal of increasing the quality of life. mailing brochures at the non-profit rate!